Costa Canara lies above Dolcedo. From here there are fantastic views of the beginnings of the Prino Valley. Discover the wonderful scenery around Costa Canara on foot, by mountain-bike or even on horseback! There is a horse-riding centre in Dolcedo, where you can go and book riding tours through Costa Canara‘s hinterland. If you love taking a relaxed bath in the sea or sunbathing on the beach, then Costa Canara is the right place for you. You can reach the sea in just a few minutes’ time by car. There are also numerous lakes for swimming which you can go and discover around Costa Canara. In the same way, you should not miss the wonderful panoramic view over the Prino valley. Costa Canara is a small village in the municipality of Dolcedo. The village lies above Dolcedo and was already settled by human populations during the early Middle Ages. Like many other coastal towns, Costa Canara was attacked several times by pirates during the Middle Ages. It became part of the municipality of Dolcedo in the 12th century. 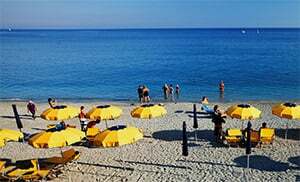 Costa Canara belongs to the municipality of Dolcedo and is one of the villages in the province of Imperia which lies in the Liguria region. There are several other villages near Costa Canara and they include: Isolalunga (2.6 km), Bellissimi (2.2 km) and Dolcedo (1.6 km). When coming from Genoa, take the highway exit to Ovest, then drive along Via Maurizio Caprile, Corso Salvador Allende, SP11 and SP42 towards Via Ruffini in Costa Canara.